A British non-romantic comedy built on white lies, pink elephants and grey areas. LONDON: Four sisters swipe left on everything they hate, one cocktail at a time. Louise dreams of an exotic lifestyle, miles away from Hackney. Nick comes along. Famous, fit, funny and filthy rich. She will stop at nothing to seduce him. She will fake it till she makes it. All the way to the ka-ching bling ring. But the little white lies soon snowball into a mountain Louise’s Louboutins can’t climb. Jess juggles work, two babies, a cheating husband and nannies from hell. Carla goes on a bender, and wakes up next to her young assistant. Freddie. Emily is getting over her cheating ex by throwing herself into the dating scene. When work, dating and proposals…all go wrong, the four sisters’ friendship is their only lifeline. The first thing I'll say about this book is don't judge it by its cover. Thankfully, I never judge a book by its cover or I might not have discovered this fabulous book by Linh Le James. Perhaps it's because I remember the shell suit era that the cover of #Toots makes me shudder but when I figuratively peeled back the hideous nylon layer I discovered an absolutely brilliant book. Anyone who follows me on Goodreads would have missed my updates for #Toots because I started it and finished it in one sitting. I simply couldn't put it down as my eyes were glued to my kindle following the lives of these four crazy sisters. As each sister inevitably raced towards the latest car crash drama in their life it was like I could see it happening in slow motion but couldn't, and didn't want to, slow my reading pace. We've all been there and done crazy things (or is that just me?) so as crazily hilarious as the story is, it actually feels very true to life. Where relationships are concerned, it's like every daft thing you've ever done, or thought about doing, is in this book. With so much drama crammed into this book, Linh Le James has still managed to create characters that are so well developed that I felt like I got to know them, almost like a fifth sister. Not since Little Women have I felt so connected to a group of siblings but #Toots is like the March sisters putting their gladrags on and going on a bender! I was literally crying with laughter at times and when I turned the final page, I was already crying out for more so I'm absolutely thrilled that there is a sequel planned. I can't wait to meet up with my literary sisters again! If my blog had an award for most surprising book of the year, #Toots would definitely walk away with first prize. 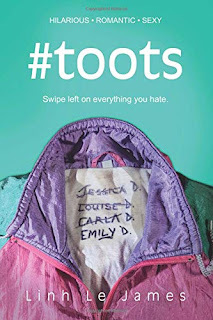 I've never read anything like #Toots before; it's unique, funny and completely addictive. An easy five stars from me for this exceptional debut by Linh Le James; romcom fans, you don't want to miss this one! Quick read, characters identities are everywhere, positively. Interesting and funny just as miserable and furious, makes this book so fulfilling an excellent ghostwriter for hire I Love Freddie and his requirement for Carla is genuine, if no one but she can quit acting like she is unreasonably old for him. Can hardly wait for book 2.